Historically signs have been created and displayed to make known to the public the name and nature of business endeavors. Such communication often involves pictures as well as words as can be seen on signs that have been displayed in Gilford over the years. What to do with a sign when a business endeavor is sold, especially out of the family, has often been a perplexing problem. Sometimes the sign is sold along with the property; in other cases the sign is not. Fortunately over the years some of the old Gilford signs have been given to Thompson-Ames Historical Society. These vintage signs are now displayed in The Hallway of Historic Signs. Two farm signs that hang side by side on one of the hallway walls offer a unique contrast. 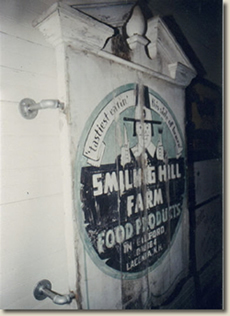 The "Smiling Hill Farm" sign from up on Cherry Valley Road is truly weathered in appearance, while the "Gunstock Hill Farm" sign is in almost new condition. Do you wonder why? Obviously the condition of the former is the result of having been out in the weather for many, many years. 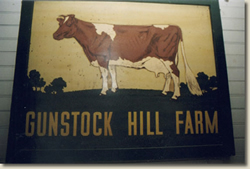 The other sign left Gilford in 1972 with Penny Washburn to help her remember the farm that she had lovingly owned for four years. The sign hung in Penny's living room in Vermont and then in Florida for years -- until 1997, when Jessie Smith Naylor told Penny of T-AHS's Hallway of Historic Signs. Without hesitation Penny decided that the sign should be returned to Gilford where it would forever be a part of Gilford's cultural heritage.